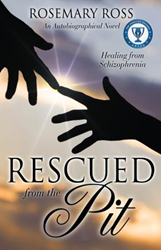 Rosemary Ross’s new book, Rescued from the Pit - Healing from Schizophrenia, ($17.99, paperback, 9781498403795; $8.99, e-book, 9781498403801) tells the author’s true life story and personal healing from Schizophrenia. She wants to help people with severe mental illnesses – and their families and friends – to understand that they can be healed as she was. Her book spreads the message that if someone is mentally out of touch with reality, proper adherence to psychiatric medications can bring their minds back to reality – but the medicine is extremely important. She now tells her story with the hope of helping others – an inspiring story of triumph over insanity. Rosemary Ross was very happy as a small child until age seven. At that time, her mother remarried a mentally ill and violent man who abused Rosemary for the next thirteen years. Then a failed marriage and other traumatic events gradually brought Rosemary down into the pit of schizophrenia. She became a Christian in the midst of all her troubles. Four years later, an answered prayer gave blessed healing which has lasted for the last fifty years. She was able to earn two bachelors degrees, and, at age sixty-three, an MA degree in mental health counseling. She worked with persons suffering from mental illnesses. Earlier, Rosemary worked for eighteen years as a special education teacher and also as a counselor. For fifty years now she has lived with a sound mind – a gift for which she gives thanks to her precious Lord. Xulon Press, a division of Salem Media Group, is the world’s largest Christian self-publisher, with more than 15,000 titles published to date. Retailers may order Rescued from the Pit - Healing from Schizophrenia through Ingram Book Company and/or Spring Arbor Book Distributors. The book is available online through xulonpress.com/bookstore, amazon.com, and barnesandnoble.com.